Willow Creek Heights No. 3 is the third Phase of Willow Creek Heights a residential Planned Unit Development located in Washington County, Oregon. 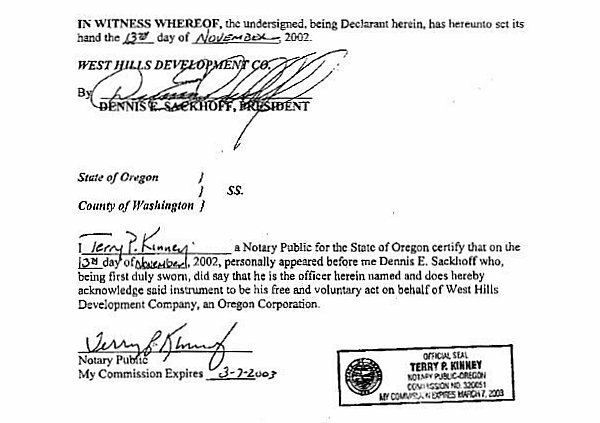 Willow Creek Heights Phases 1 and 2 are plats recorded in Washington County Deed Records as Documents No. 2001013473 and No. 2001091530, respectively. Willow Creek Heights No. 1, Willow Creek Heights No. 2 and Willow Creek Heights No. 3 are phases of a planned multi-phase development consisting of single family housing in multiple phases. The three phases include 153 lots. 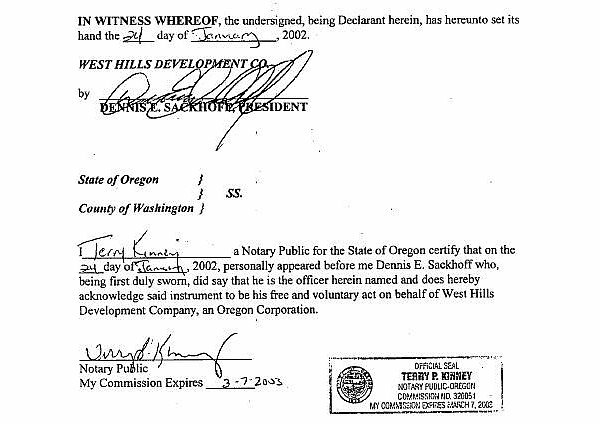 The Declaration of Willow Creek Heights (recorded in Washington County Deed Records as Document No. 2001013475 ) established that Declarant, at it sole discretion, can amend the Declaration to apply to subsequent phases of development. The Declarant reserved the right to amend the Declaration to reflect incorporation of additional land, additional and/or different provisions which reflect governmental, physical and market requirements as additional phases are approved and constructed in Willow Creek Heights. NOW THEREFORE: by this document Declarant amends said “Declaration” as follows: Declarant hereby declares that Willow Creek Heights property shall be held, sold and conveyed in accord with all applicable governmental ordinances and development agreements, obligations and the covenants and conditions restrictions, (CC&R’S), Homeowner’s Association Provisions (Provisions) as amended by this document,. The terms of the CC&R’S and Provisions as herein amended shall inure to the benefit of each owner of property in Willow Creek Heights and shall be binding on all parties having any right, title or interest in Willow Creek Heights property or any portion thereof, their heirs, successors and assigns. These, CC&R’S and Provisions shall run with and attach to the subject property and bind all the real property within Willow Creek Heights. All terms contained in the original “Declaration” and subsequent amendments or addendum thereto, recorded prior to recordation of this document, which are not altered by the terms of this document, shall remain in effect. If there is a conflict between the terms of this document and the original “Declaration” and subsequent amendments or addendum thereto, recorded prior to recordation of this document, the conflict shall be resolved by looking first to the terms of this document which shall be controlling. If confusion still exists the resolution shall be based upon the intent of Declarant herein to have the obligations contained in the original “Declaration” apply to all lots in all phases of the Willow Creek Heights unless specifically altered. A). An error appears in the Declaration of Willow Creek Heights Phases 1 and 2. That Declaration relates only to lots 1 through 144, inclusive and specified Tracts. Not lots 1 through 145, inclusive, as previously stated. B). The “Declaration” shall now also apply to lots 145 through 153, inclusive and Tracts “I”, “J” and “K”. Owner of said lots shall become part of the Willow Creek Heights Homeowner’s Association with all rights and obligations which accompany membership in said Association. D). Tracts “I” and “J” are subject to a public pedestrian and bicycle easement over their entirety. E). Tracts “I” and “J” are subject to a sanitary sewer easement over their entirety to Clean Water Services. G). Tract” J” is subject to a storm and surface water drainage easement over it entirety to Clean Water Services. H). Tract” J” is subject to a public utility easement over its entirety. I). Tracts “I” and “K” shall be owned and maintained by the Willow Creek Heights Homeowner’s Association. J). Tracts “I” and “K” are subject to a wall, landscape, fencing, and irrigation maintenance easement over their entirety for the benefit of, and to be maintained by, the Willow Creek Heights Homeowner’s Association. K). Tract “K” is subject to a storm and surface water drainage easement over its entirety to Clean Water Services. L). The easements noted as W.L.F.I.E. and L.F.I.E on plat are for the benefit of the Willow Creek Heights Homeowner’s Association. M). There shall be no direct motor vehicle access to or from any lot or tract in Willow Creek Heights onto N.W. Saltzman Road except at access locations approved by the governing body with jurisdiction of said N.W. Saltzman Road. Mitigation of road noise impacting their property resulting from any future widening ofN.W. Saltzman Road will the responsibility of the individual lot owners. N). THE INITIAL ANNUAL FEE FOR THE HOMEOWNER’S ASSOCIATION SHALL BE TWO HUNDRED FIFTY DOLLARS ($250) PER LOT. THE FIRST ANNUAL FEE AMOUNT IS PAYABLE TO THE DECLARANT ON BEHALF OF THE HOMEOWNER’S ASSOCIATION AT TIME OF CLOSING. ADDITIONAL ANNUAL FEES SHALL BE PAID TO DECLARANT ON BEHALF OF THE WILLOW CREEK HEIGHTS HOMEOWNER’S ASSOCIATION UNTIL THE ADMINISTRATION OF THE HOMEOWNER’S ASSOCIATION IS TRANSFERRED TO THE INDIVIDUAL MEMBERS AS HEREIN SET FORTH. Willow Creek Heights, a residential Planned Unit Development located in Washington County, Oregon. 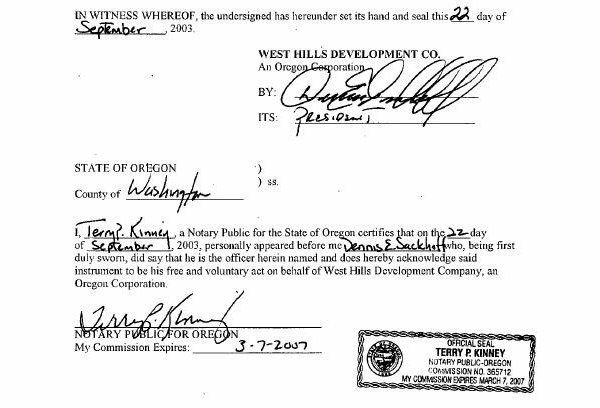 Willow Creek Heights and Willow Creek Heights 2 are plats recorded in Washington County Deed Records as Documents No. 2001013473 and No. 2001091530, respectively. A third phase of Willow Creek Heights, Willow Creek Heights No.3 is recorded in Washington County Deed Records as Document No. 2002-011413. The three phases include 153 lots. The Declaration of Willow Creek Heights (recorded in Washington County Deed Records as Document No. 2001013475) established that Declarant, at it sole discretion, can amend the Declaration to apply to subsequent phases of development. This Planned Unit Development is subject to the conditions of approval contained in Washington County Department of Land Use and Transportation Case Files No. 00-110- S/D(CI)NIHRV/WIDl}AJP/DFR and 00-366-MR.
NOW THEREFORE: by this document Declarant amends said “Declaration” as follows: Declarant hereby declares that Willow Creek Heights property shall be held, sold and conveyed in accord with all applicable governmental ordinances and development agreements, obligations and the covenants and conditions restrictions, (CC&R’S), Homeowner’s Association Provisions (Provisions) as amended by this document. The tenns of the CC&R’S and Provisions as herein amended shall inure to the benefit of each owner of property in Willow Creek Heights and shall be binding on all parties having any right, title or interest in Willow Creek Heights property or any portion thereof, their heirs, successors and assigns. These CC&R’S and Provisions shall run with and attach to the subject property and bind all the real property within Willow Creek Heights. 1. Administration of the Homeowners Association shall be transferred from Declarant to the members no later than when homes on 75% of the total lots in all phases of Willow Creek Heights P.U.D. have been occupied. The Declarant shall call a meeting for the purpose of turning over administrative responsibility for the Homeowners Association and related property to the Association not more than 90 days after 75% of all homes in all phases are occupied. Upon transfer of the Association, Bylaws for the Willow Creek Heights Homeowners Association shall govern Association activities. The Architectural Control Committee shall render its decision with respect to the proposed work within 21 days after it has received all required materials. The Declaration of Willow Creck Heights (recorded in Washington County Deed Records as Document No. 2001013475) established that Declarant, at its sole discretion can amend the Declaration in accordance with the provisions contained therein, and.the Declarant meets the ownership conditions described in and subject to the Declaration. 25). The Architectural Review Committee may from time to time develop or adopt and publish architectural and design guidelines or similar documents (“Design Guidelines”). The purpose and function of Design Guidelines shall be to interpret, implement, augment and supplement, but not to replace, the provisions of this Declaration, and shall provide a synopsis of the requirements and,policies of the Committee respecting Improvements, Design Guidelines may include, without limitation, minimum requirements for square footage, building materials and exterior design of Living Units, landscaping, fencing, and the like. 26). The Association from time to time may adopt, modify or revoke rules and regulations governing the conduct of persons and the operation and use of Residential Lots and the Common Areas as it may deem necessary or appropriate in order to assure the peaceful and orderly use and enjoyment of the Property, A copy of the rules and regulations, upon adoption, and a copy of each amendment, modification or revocation thereof, shall be delivered by the Association Board of Directors promptly to each Owner and shall be binding upon all Owners and occupants of Residential Lots upon the date of delivery. The method of adoption shall be as provided in Article VII, Section 7.1 (A) of the Bylaws of the Association. Do you get the emails? Help keep costs down. Send your email address to board@willowcreekheights.org to be added to our email list. Poll: Would you be interested in a service to mow your front yard?